Put this into your install procedures. Enable core dumps so that when your firewall starts rebooting magically at 1am, you don’t have to go into panic mode trying to figure out how to get a core dump for analysis. If you do this now you will save about 24 hours of your life (and sleep). This should be enabled by default but it is not. I’ve been asking this everytime I see a Check Point shirt on a body. Actually asked T3 support yesterday and they didn’t know. I’m coming closer to an answer. We took a box and jammed 144GB into it. Loaded GAIA and booted. We took out memory down to 64MB. Switched GAIA into 64-bit mode ‘ set edition default 64-bit’ command, remember ’64-bit’ and not ’64’. Jammed in memory back to 144MB. ‘top’, ‘vmstat’, ‘free’ all recognize all the memory. Now whether GAIA really uses it……The hunt continues. I made this cheesy video for learning SmartLog. Just FYI, I loaded up a SmartLog with 1.3 billion logs and filled the disk and guess what? It elegantly deletes old entries to make way for the new files. That’s what I can remember for now. Just love it! Thanks Dudi. [UPDATE: 2/14/2014] I have spent several months putting together how SecureXL/CoreXL works, creating labs, talking to developers and people much smarter than me. I am putting together a class on the topic . I have to update this blog to reflect reality when I get time. Its probably about 75% correct….. Ya know, I wish I could explain how SecureXL works but everytime I think I get it…I’m wrong. I’ve had several different CP people try to explain it to me.. and parts are wrong. So I’m not sure what to tell you. This will be my worst blog ever, but my goal is to spend my golden years trying to figure out how SecureXL works and fix this blog as I go. You can stop reading now…. I was sent this document that does a great job of explaining SecureXL. But if its accurate who knows. For example: there is a statement in the SecureXL document that says any non-TCP/UDP/GRE rules will turn off all SecureXL. Well so much for ICMP I guess. But I think its wrong…. Acceleration is still turned on. The basics you should remember. 1) Accept Templates: Some protocols like HTTP 1.0 create MULTIPLE concurrent connections from a client to a single port on a single server, port 80. The rate of of acceptance by SecureXL is increased by caching these connections into a “template” connection table. After the first connection – any future ‘similar’ connections to the common port from that client are NOT forwarded to the firewall kernel, but instead instantly accepted and forwarded. 2) Connection Accelerated: SecureXL increases throughput on connections that have already been setup and inserted into connection table between a client and server. The successive packets in a connection will not go through the kernel but will be handled by interrupt handlers (watch your SI on ‘top’ command). The following diagram was done by 51sec ….. Unfortunately SecureXL sometimes it feels like it only works if there is a full moon and NAT, VPN, IPS, and 100 other services are not enabled. If you do a fwaccel stat you will start to get feel of what is enabled…but I’m still leary. Also remember that fwaccel stats (with an ‘s’) is a totally different command. 1) Accept templates/Connection templates/Connection accelerated: is overloaded. They are referring the grouped mainly HTTP traffic that creates templates in order to accelerate similar connections from 1 source PC. It is a ‘template’ because it intends to accelerate ‘similar’ traffic, not an exact connection. 2) Throughput acceleration: Connection table acceleration. Is to accelerate the second and subsequent packets of a connection. These packet have to perfectly match the connection table. Below you can see the two commands, stat and stats. The stat command will tell you if connection templates #1 above is turned on and at what rule connection templates (not acceleration) is disabled, in this case rule #1 (by the red arrow) disables the creation of connection templates. This is what I wish I could tell you what the magic is, but I can’t I get different versions of reality. I know ICMP impacts because SecureXL was mostly designed just for HTTP connections grabbing 30 different pages from one client. The numbers in green list how many connections from templates of all connections are created and how many connections are going through the firewall kernel (F2F) for processing. You can see here that because rule #1 disables templates that 0 connection templates are created. The second part below in red shows throughput acceleration from #2 above. “accel packets” is packets that are not forwarded to the firewall kernel and F2F are packets that are forwarded to the firewall kernel for rule processing. These are NOT the same as Accept Templates which are related to accelerating HTTP requests from a single PC. Only accelerating the second and subsequent packets from a single connection. Just a little more detail here. This is the ‘fwaccel stat’ and the ‘fwaccel stat -s’ command. that got forwarded through the kernel and not handled by interrupt processing). Kasper has figured out (THANKS!!!) that PXL is really PSL, Packet Streaming Library which Check Point uses for its IPS engine. It re-assembles IP packets so the IPS engine can inspect them (I have to update this diagram). You can read about it here. Why am I telling you this? Well, if for whatever reason you are wary of SecureXL (or don’t have a license) and decide to turn it off you can look at the before and after. You can also do you own ‘acceleration’ by moving the most hits rules to the top of the policy so they get hit first. 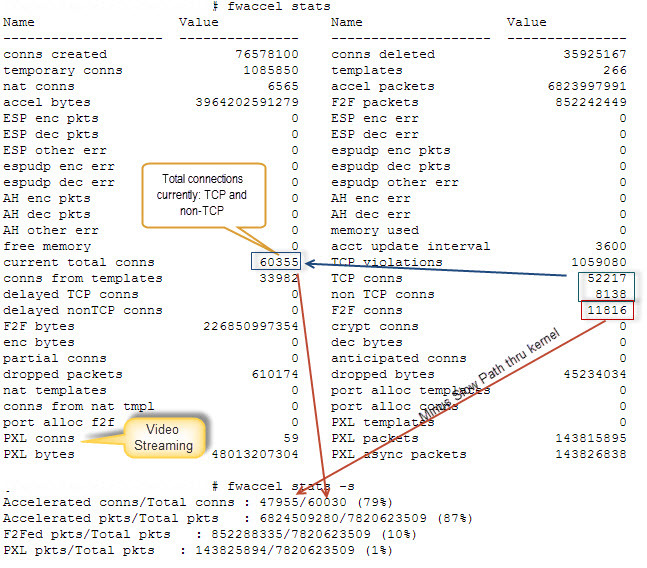 You might have to use Tufin to figure out what the connection counts are on a per rule basis. CP also has some magic software where if you do a ‘fw tab -t connections’, they can tell you what rules are getting hit the heaviest. And of course don’t trust SmartMonitor to report the right #’s. CP official policy is SmartMonitor is broke when SecureXL is turned on. So sad. Just sharing the love here. The following rule properties present in the security policy will disable throughput and connection-rate acceleration for all traffic. The following traffic is not throughput or connection-rate accelerated by SecureXL. • VPN encryption algorithms that are not supported by the hardware. • IP compression enabled for VPN traffic. The following traffic is not connection-rate accelerated by SecureXL. The following environment disables connection rate acceleration for the traffic that the environment is applied to by SecureXL. You probably already know all this but it was a surprise to me. SmartMonitor is not accurate. Wow, I’m sure this was on CNN, but I missed that broadcast. OK, so when SecureXL is enabled the official CP policy is don’t trust SmartMonitor. SmartMonitor will report that CPUs are at 25%. Well WRONG. That is the average CPU for all processors. You have to manually inspect the processors that are licensed and configured with coreXL with ‘top’. Notice that only the # of allocated processors that have kernel instances on them are actually doing the work while the other processors are idle.. So if you are doing SNMP monitoring, so sad to bad – SOL as we say in Minnesooooota – Snow Out Of Luck. Oh yeah, be careful applying licenses with coreXL and adding/subtracting processors. It will dynamically alter the number of CPUs permitted to run and you might have a member go into ‘ready’ state if the number of processors is not consitent across all cluster members. So you have this big outage, and management is banging at your door “ROOT CAUSE”. What is a CP geek to do? As we know the problem with most loggers including SmartTrackeris you only get to see the forest through a small straw. SmartLog gives you the helicopter view and quickly. SOOOOO. they finally fixed sk73360. Num_days_restriction_for_fetch_all_integrated tells SmartLog how many days to go back and index log files. So 150 says go back 150 days and index those files up to the present day. You can tell when the index works or not by going into the $SMARTLOGDIR/log, and “tail -f smartlog_server.log”, and you will see the read rate counters indicating the number of records it has read. If you monitor closely it will also show you files it ignores and why. So I haven’t figure out all the parameters to get this to work and will soon, but for the time being this should give you enough info to do quick and dirty forensics. Check Dr.StrangeLog out for more info, good read. NOTE: that you only get IP addresses because the names and IPs and rules numbers can’t be correlated with the objects.C database from the server you imported the log files from. You’d have to joing this SmartCenter to the domain in order for them to share the objects.C file. But what do you want for 5 hours of work? SmartLog- awesome. Quick and Dirty.